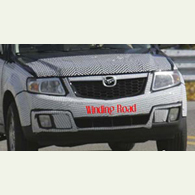 (autoinsidernews) - Spy photographers have caught the next Mazda Tribute during final testing. Nearly undiguised, the Tribute shows an overall shape nearly identical to the recently revealed 2008 Mercury Mariner and we're assuming the 2008 Ford Escape. While the overall shape is the same, the Mazda Tribute sports a different front fascia, including Mazda's corporate five-sided grille, new headlamps, and a unique bumper andlower fascia. To our eyes, the Mazda also gets a new hood, with a larger power dome. Out back the only noticable difference is new taillamps, reports Trend. We expect the 2008 Tribute to feature the same powertrain options as the Mariner. We would like to see Mazda differentiate the Tribute from its Ford and Mercury siblings, with a Zoom-Zoom model featuring the turbocharged engine from the new CX-7, but that would move the Tribute into the CX-7 territory, so it is highly unlikely. The Tribute will likely be postioned as the more utiliartian offering, with the CX-7 maintaining the true Zoom-Zoom.